Grandad decided to describe the Goldring Lenco record deck to Junior. He told him that Goldring had been making pickups since the days of acoustic gramophones. 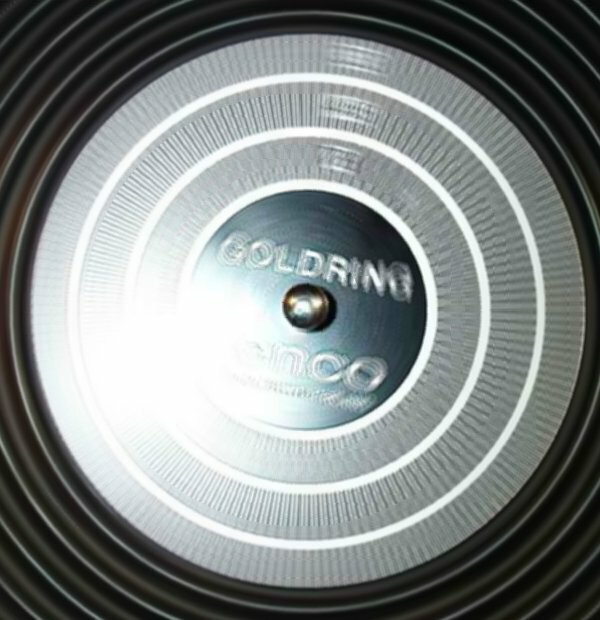 They teamed up with Lenco, who made turntables, to become 'Goldring Lenco'. The firm made high quality record player decks for 'normal' use, as well as axcellent quality transcription decks. The commercial decks use a mains induction motor as the drive source. This have an extended shaft with a slowly tapering section that provides speed changing. The taper is not even, but has flatter sections at the 'normal' record speeds of 16.7, 33.3, 45 and 78 r.p.m. so that adjustment around these speeds is less tricky. The adjuster arm moves a rubber-faced idler wheel along the taper. The wheel acts, not on the flanged rim of the turntable, but on the underside. 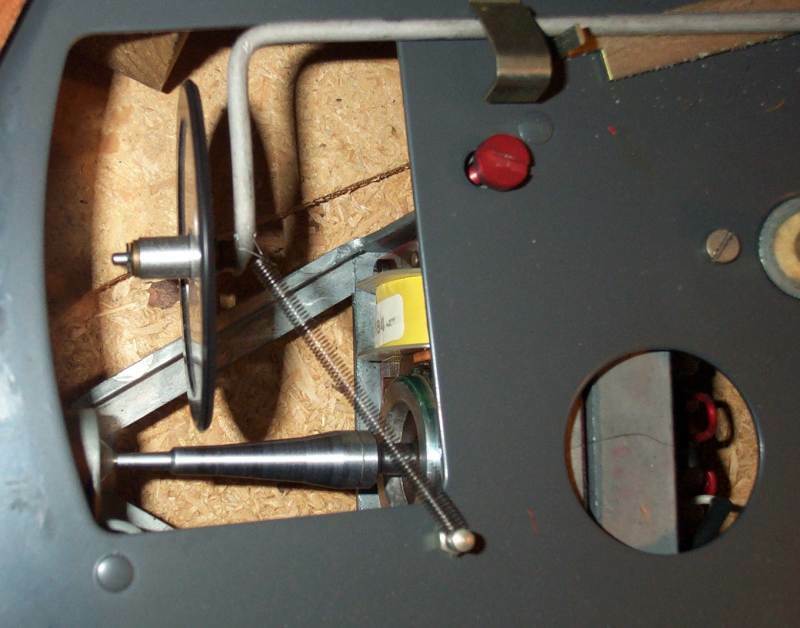 As the speed adjuster is moved, so the idler wheel moves towards the centre or outside of the turntable, which also varies the final speed, so the taper was designed with this in mind. The user adjusts the speed by sliding a lever, rather like the adjuster on some spring-motor gramophones of earlier years. Adjustable raised detents allow the positions of the standard speeds to be located easily, but small changes are easy to make. A stroboscope disc is available to help adjust the speed. This is shown in a later picture. It is a small disc that sits on the record spindle. It has short radial lines in rings around it. The quantity and spacing of the lines is chosen so that when the disc is lit by an a.c. mains lamp, the appropriate lines appear to be stationary. Since the mains frequency is fairly accurate, this allows the speed to be set properly. On this Lenco deck, a screw at each speed setting allows the detent for the adjuster to be moved slightly if necessary. 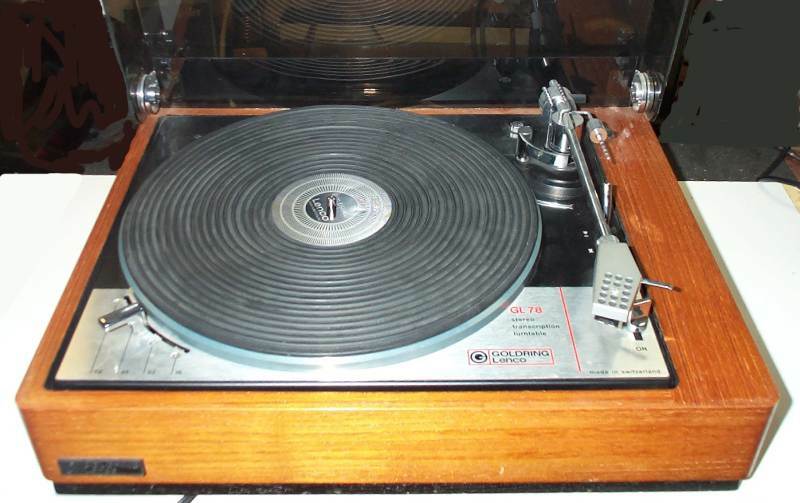 In the cheaper models, such as the GL72, the turntable is cheaply made from pressed steel. 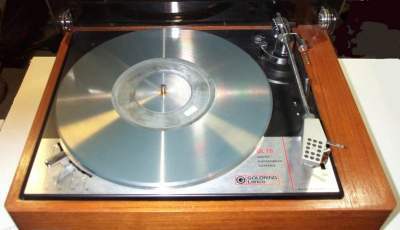 The more expensive models, such as this GL78, have a cast aluminium turntable that is much more massive and gives much better speed constancy, like a flywheel. Hidden by a recess in the metal deck, the edge of the cast turntable has metal removed from the periphery in order to make sure that there are no heavy, unbalanced areas that would give vibration. These shallow drillings can be seen in the picture. The pickup arm on Goldring-Lenco decks is fairly conventional, with some models having a bias control 'weight on a string' to counteract the tendency of the pickup to press harder on one side of the record groove at low tracking weight. They all had adjustable tracking weight, often using a sliding weight behind the head pivot point to counterbalance the headshell and pickup cartridge. The headshell is detachable from the front of it's arm, for ease of access to the cartridge. Goldring made good quality pickup cartridges and stylii. They were usually low output moving-magnet types, which needed proper amplification and frequency compensation to get the correct frequency response. 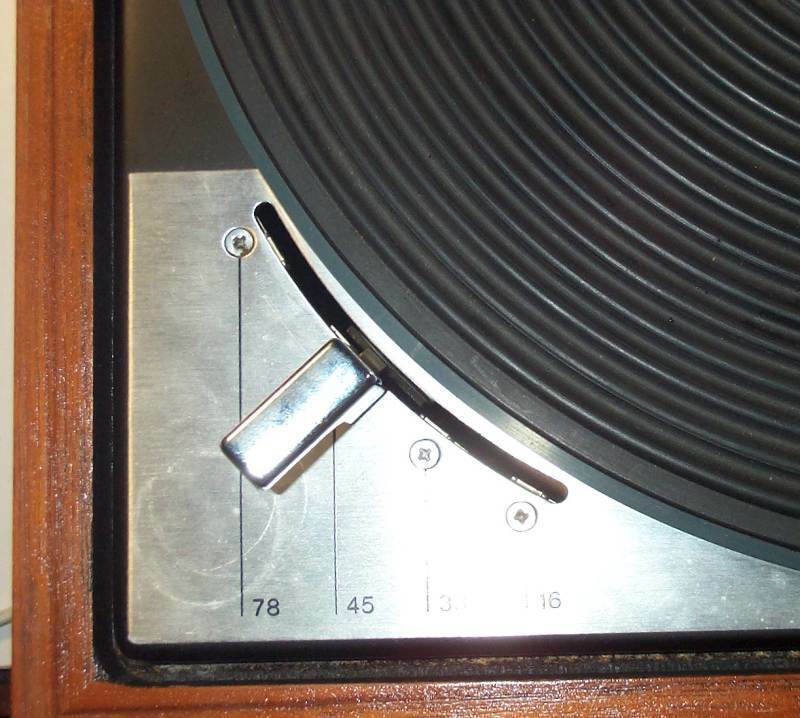 There was only a single stylus on this type of cartridge, so changing from microgroove to 78rpm records was normally achieved by swapping the headshell and cartridge for another with the correct stylus fitted. Overall view of GL78. Note the stroboscope disc at the centre of the turntable. The Stroboscopic disc on this deck is designed for a mains frequency of 50 Hz, or as Grandad said it, 50 CPS. The motor and the speed adjusting taper on it's shaft are also for the same frequency. 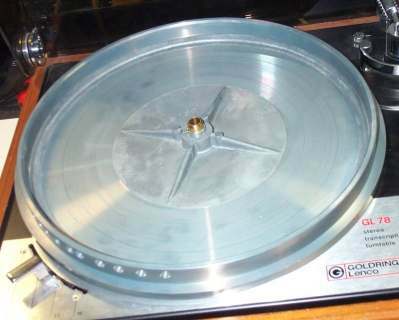 If the deck were used on other frequencies, such as the 60 CPS used in America, the turntable would run too fast, by a factor of 60/50, and the strobe disc would say that it was correct, since both would scale the same way. Because of this, users in other countries would have to employ different parts in order to get the correct speed. These Lenco decks, like others in their class, did not generally have any of the 'mass-market' items present, such as autochangers, 'turnover' dual 78/45 rpm stylii, auto-stop or similar 'parasitic' hardware. This GL78 does have auto-stop, but a knob at the rear will disable it if it is not required. Junior thanked Grandad for describing the Goldring Lenco deck, and spent some time with the stroboscopic disc. "Grandad," he said, "I'm trying to count the marks to see if there are the same number for 78 as there are pole-pieces on the old one that you showed me before. But I keep getting different answers." "Just keep at it until you get the same answer three times in a row," replied Grandad, "And let me know how it compares. I'll just be out in the shed for a while." Grandad looked forward to a few minutes of peace and quiet and thought that perhaps he could get Junior to count the marks for the other speeds afterwards.